Paperproducts Design Rose Lace coasters are perfect for your next party or for everyday use. 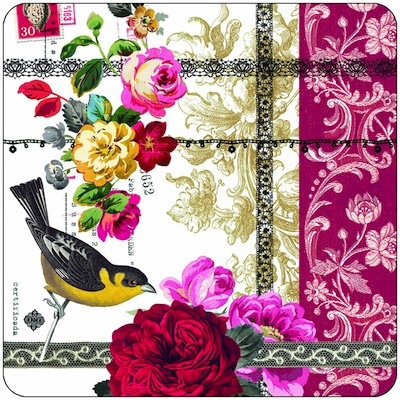 Coasters feature beautiful red, pink and yellow roses accented with a yellow and black bird in the lower left corner. They are finished off with an elegant red and gold background with ornate floral designs. Boxed set of 4. Coasters measure 4.13-inch square. Hardboard with cork back.